Roasting vegetables brings out their natural sweetness and is a great way to get kids to eat veggies. 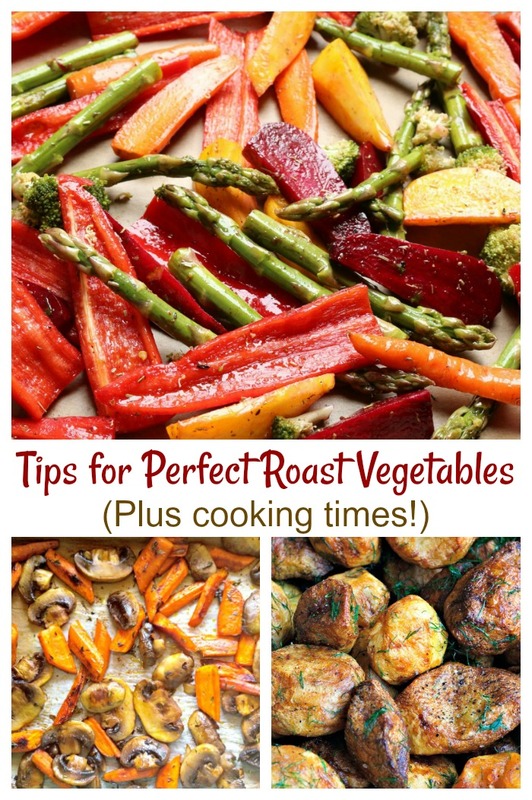 This post will help with roast vegetable cooking times and give you some tips for perfect oven roasted vegetables every time. Why are oven roasted vegetables sweeter? When vegetables are exposed to high temperatures, the heat concentrates their flavor. This will help to turn vegetables that are normally spicy or bitter into a sweeter taste. One of my most often used cooking tips is that if your kids balk at the idea of eating vegetables, try roasting them. You’ll be surprised to discover how many more they will eat when the flavor is this delicious. Roasted vegetables are crispy on the outside and have a warm and comforting center. Kids will love the taste and texture of them. Roasted vegetables make a great side dish and are also wonderful in salads and breakfast casseroles. Roasting vegetables in the oven is the perfect way to add a lot of flavor to vegetables without adding too much to the calorie count. This makes them perfect for those wanting to lose weight. Depending on the seasonings you use, roasted vegetables can be gluten free, Paleo and perfect for those following Weight Watchers and other diet plans. They fit into the Whole30 program and are the perfect choice for those following a vegetarian and vegan diet. Getting perfection with roast vegetables means more than just putting vegetables in a baking dish and turning on the oven. These tips will help make your oven roasted vegetables a success every time. 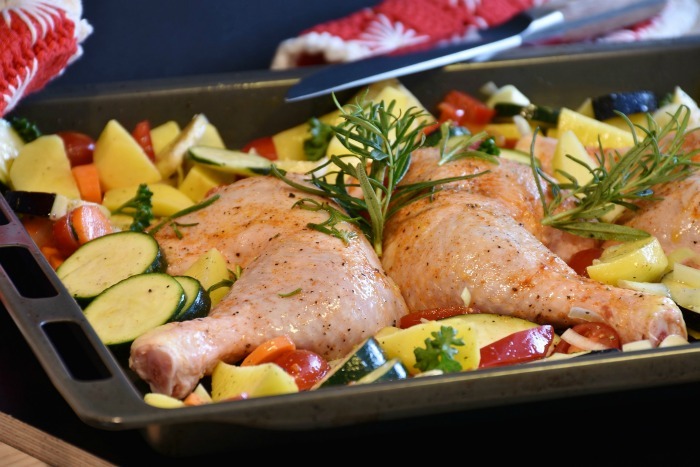 Roasting vegetable can be a messy process, so using a liner for your baking sheet makes clean up easier. 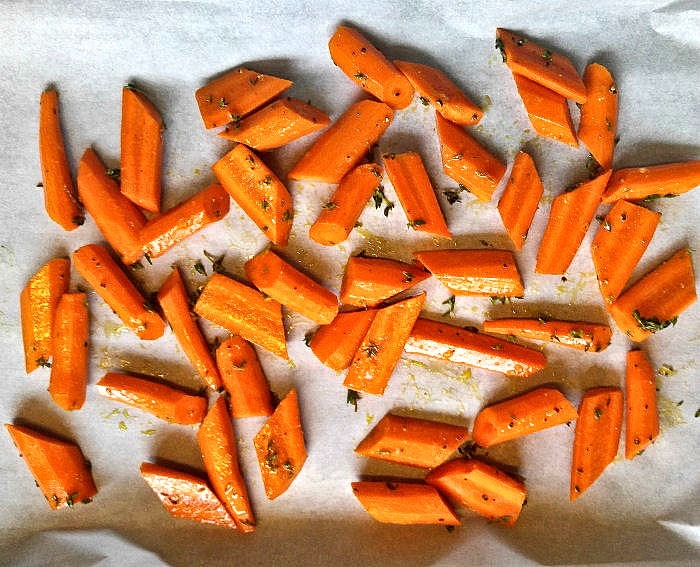 I use both parchment paper and silpat mats to roast vegetables. Parchment paper is a heat proof baking paper that is cellulose-based. This paper has been treated or coated to make it non-stick. It is a great liner to use on baking sheets to roast vegetables. Get some other uses for parchment paper here. Be sure to cut the paper a bit larger than your baking pan to give it a bit of a lip on the sides. 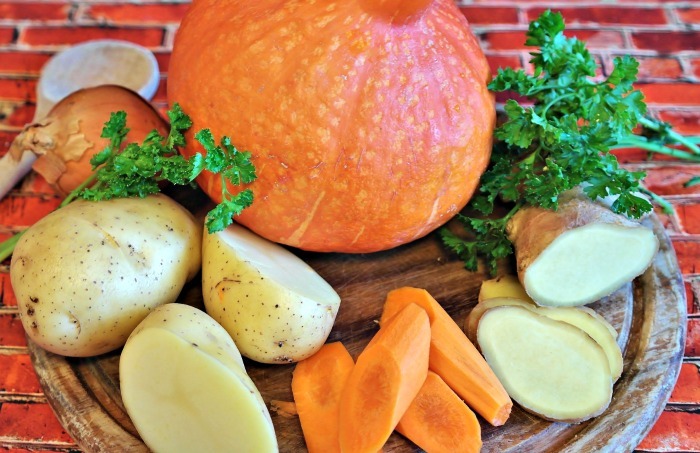 When roasting is finished, serve the vegetables and throw away the paper for an easy clean up chore. 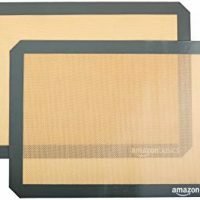 Silicone mats (also known as Silpat mats) are made from high quality, food-grade silicone. 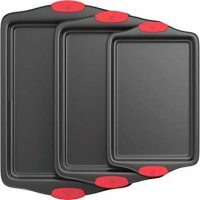 These mats come in several shapes and sizes to fit various sized baking pans. See my additional tips for using silicone mats here. Roasted vegetables are very easy to prepare, since the oven does most of the work, but you do need to spend some time on the prep work. 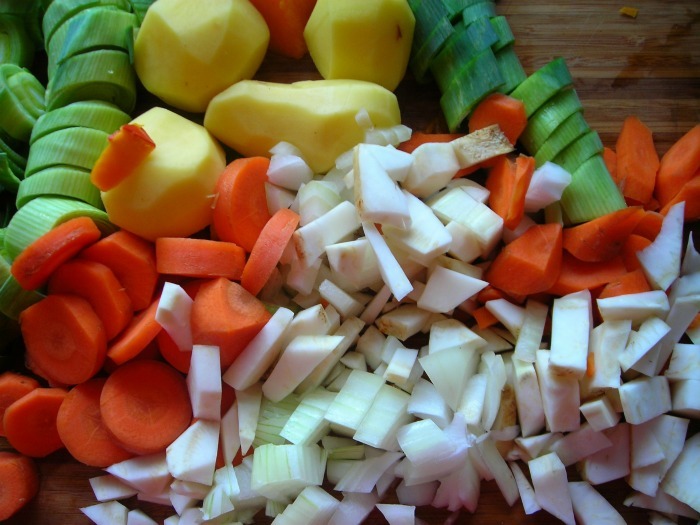 Cutting the vegetables into evenly sized pieces will ensure that they cook evenly. It also allows you to combine more than one vegetable onto a cooking sheet. When you cut, make the pieces smaller. Avoid large chunks. While you CAN roast them this way, cutting the vegetable into smaller pieces will make them cook more quickly and will give you more of the crispy outside edges on the plate. Roast vegetable shrink in the oven when cooking, so cut a few more than you might normally do for steamed vegetables. The flavor is so good, they won’t go to waste if you have too many, believe me! And consider adding protein to the sheet for a truly easy one pan meal. A drizzle of olive oil along with your seasonings will give your vegetable a lightly oiled outside which helps with crisping them during cooking. It’s also a good idea to turn the vegetables on the baking sheet half way through the cooking process. If you don’t, you’ll end up with over cooked, hard, crisp bottom edges that will be tough to eat. If you don’t want to add the calories from oil, you can spray the vegetables with a cooking spray, but you won’t get quite the flavor. TIP: I keep my roast vegetables tasty by adding just a teaspoon or two of olive oil, and combining well. This gives me taste, and a crispy finish. Using an oil mister, such as a Misto sprayer will give a very fine drizzle of oil but plenty of flavor. 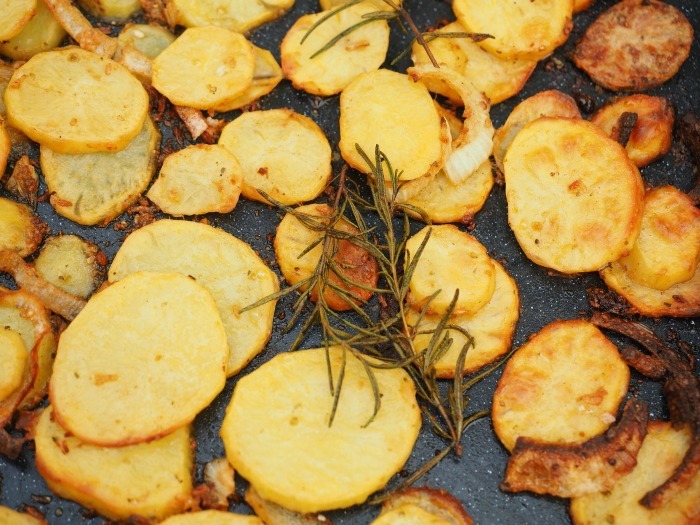 When you roast vegetables, you will want a sweet taste as well as a crisp finish to the vegetable. If you crowd vegetable on a baking sheet, you will be more likely to allow steam to cook the veggies, resulting in a softer finish. The way to combat this is the make sure there is some room around the vegetable, even if this means using two baking sheets. 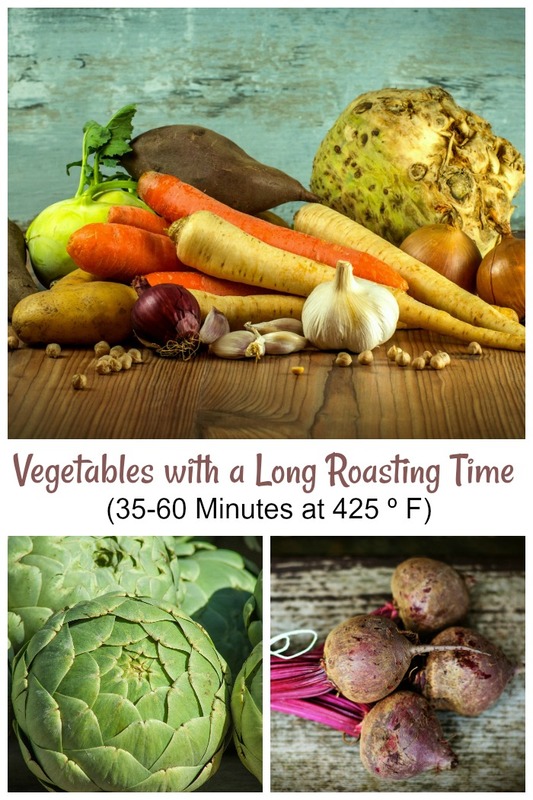 The more you roast vegetables, the better you will get at determining the roast time, but a general rule of thumb for beginners is to watch them and look for a toasted finish. When properly roasted, the vegetables should be tender enough to pierce with a fork. You should see some charred bits on the edges. Start checking about 15 minutes into the process, particularly for smaller or thin cuts of vegetables. Keep roasting until you start to see the vegetables turn toasty around the tip and edges. If in doubt, give them an extra 5 minutes or so. Longer roasting is rarely a problem but under roasted vegetables can be tough to chew if not cooked through. 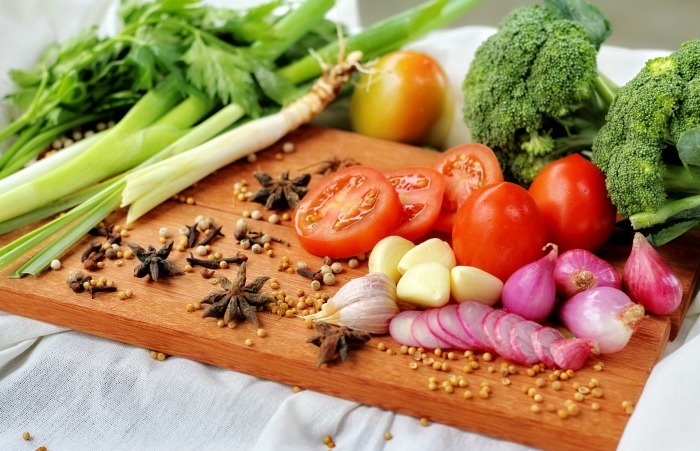 It’s easy to cook a single vegetable, but trying to manage different veggies can be a challenge. This can be done in a few ways. The best way to get perfect oven roasted vegetables is to roast them individually. This means using more than one baking sheet. This technique works best when you want to serve vegetables with different cooking times. Doing this allows you to start potatoes at the beginning of the cycle and then add a tray of broccoli part way through the cooking time. Once the roasting is finished, you can combine them on to one serving dish, if desired, for presentation. 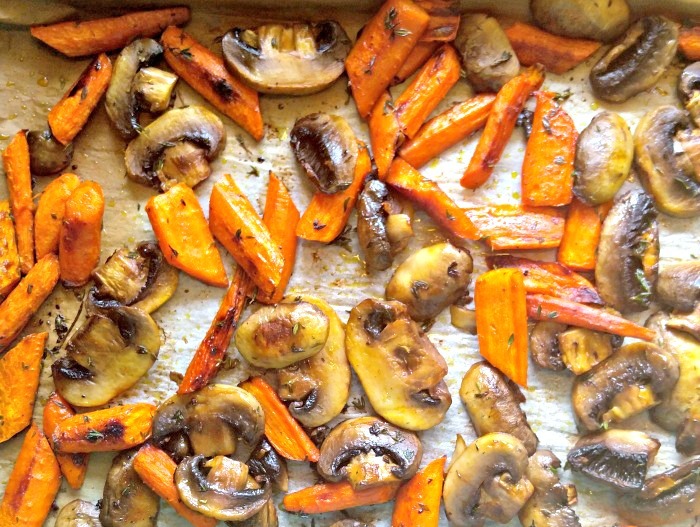 Another way to roast vegetables will give you less clean up since you’ll have just one pan. 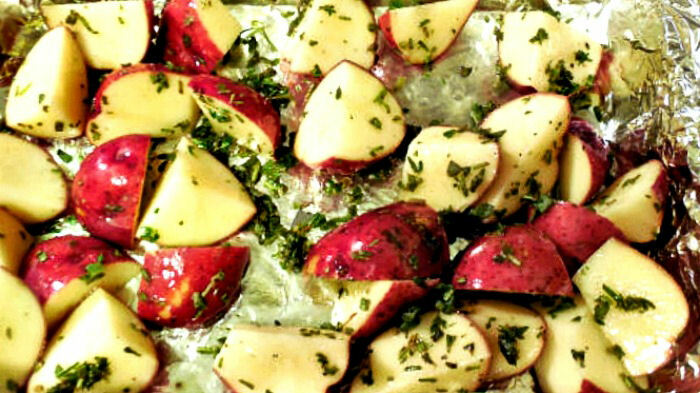 Combine several veggies on one baking sheet. For best success, cook vegetable families together. Onion and garlic, potatoes and carrots, asparagus and green beans and other similar cooking time vegetable pairings work well. This technique involves combining the two cooking processes above. Use one sheet and leave room on it. Add your longest time vegetable first, then add a second and end with a vegetable of the least cooking time if you want three. So, in the photo below, carrots would cook for about 15 minutes and the mushrooms for the final 10 or 15. This process will give you less clean up but you’ll need to monitor the baking process more closely. 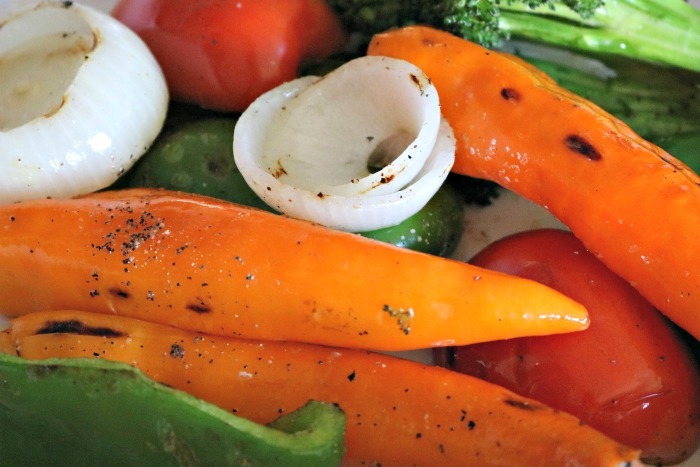 Roasted vegetables taste great on their own, but there are also some tried and true seasonings and toppings that work well with them. Try one of these coatings to season your vegetables. Use a flavored oil to easily add an extra touch of flavor and season at the same time. 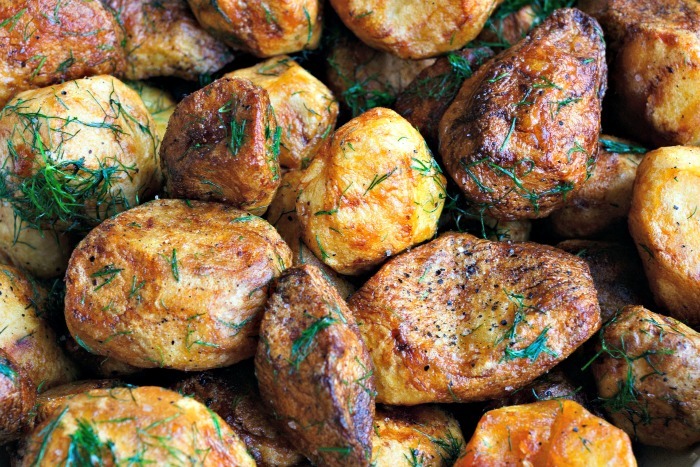 Fresh herbs add a great touch to any dish, and roast vegetables are no exception. Chop them finely for best results. 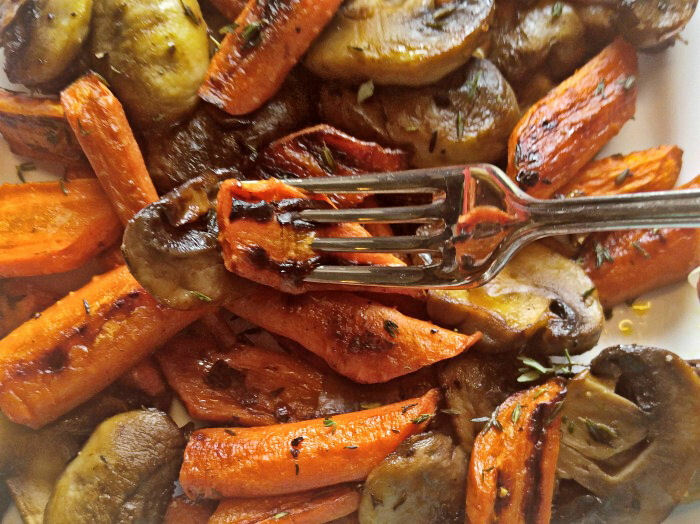 Balsamic vinegar gives an earthly flavor to roasted vegetables. These toppings add a special extra touch of flavor to vegetables baked in the oven. Citrus adds a nice fresh taste to roast vegetables and is better added when they are finished. Cheese makes just about anything taste better. 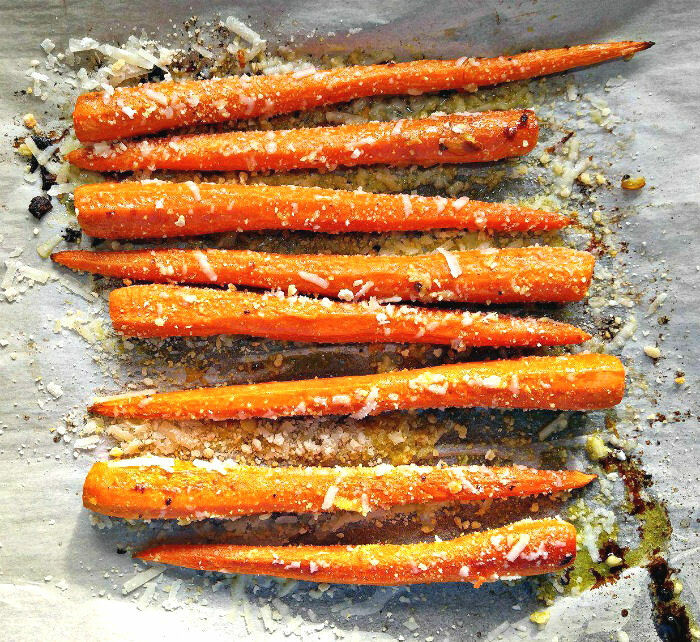 Sprinkle grated fresh Parmesan over your veggies and place under the broiler for a minute or two. Mustard has a sharp flavor and acid finish that will make any vegetable taste pop. Toss your finished vegetables in a tablespoon of creamy Dijon mustard, and adding whole grain mustard also adds texture to the veggies. Adding a sweet element, like honey or maple syrup, to vegetables before roasting means that sugars will caramelize and this gives you a nice, shiny glaze. A glaze works especially well with earthy vegetables, like turnips and Brussels sprouts. Sesame seeds add a nice texture and an Asian flair to roasted vegetables. In my charts below, i have standardized on 425 º F or 218 º C. This is the way I generally cook mine. However, if you are cooking something else in the oven at 400 º, you can still roast vegetables. Just give them a bit longer in the oven. 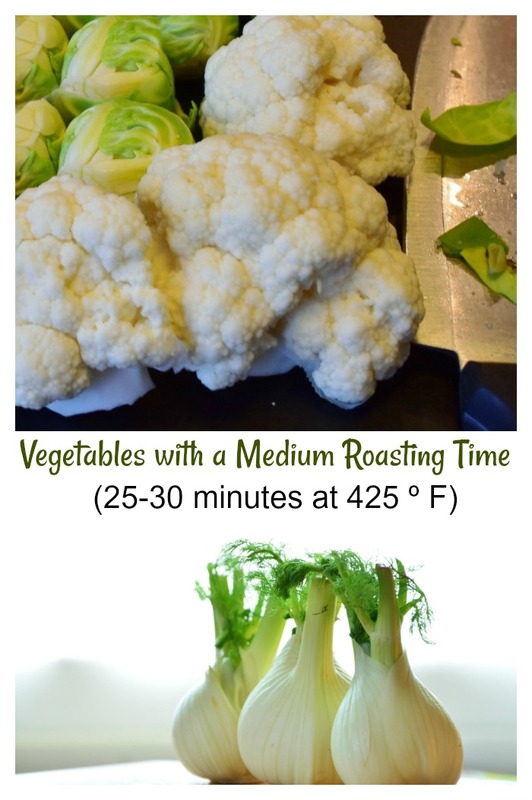 These charts will give a good idea of cooking times for roasting vegetables in the oven. For my ranges of times below, keep in mind that the more dense the vegetable is and the larger the cut you make, the longer the cooking time will be. 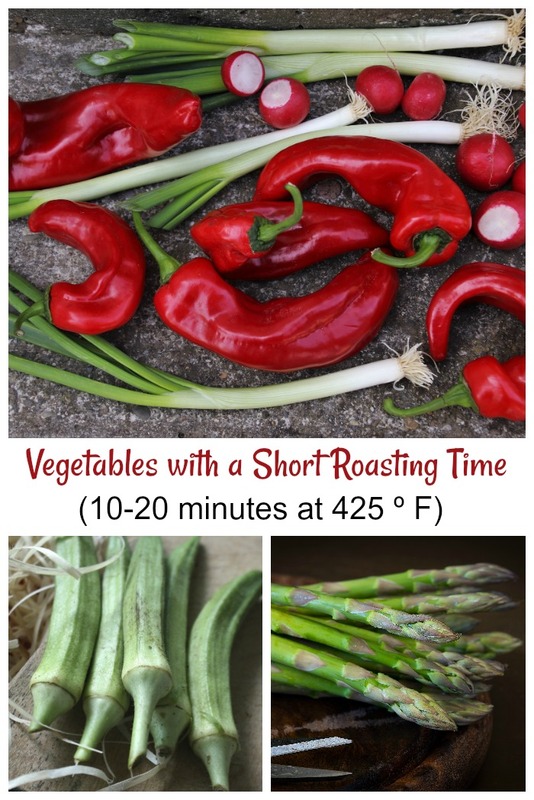 These vegetables should be cooked for about 35 – 60 minutes at an oven temperature of 425 º F (218 º C). They include most root vegetables and members of the allium family. 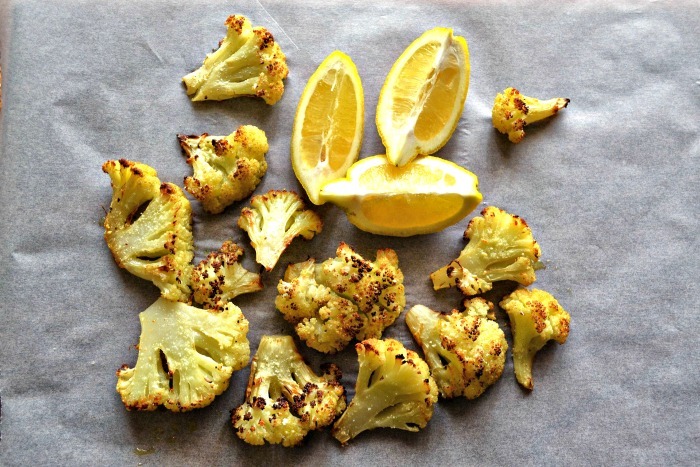 If you are in a hurry and want roasted vegetables on the table quickly, choose these. They’ll take about 25 – 30 minutes at 425 º degrees (218 º C.) The vegetables in this group have a higher water content in the main. 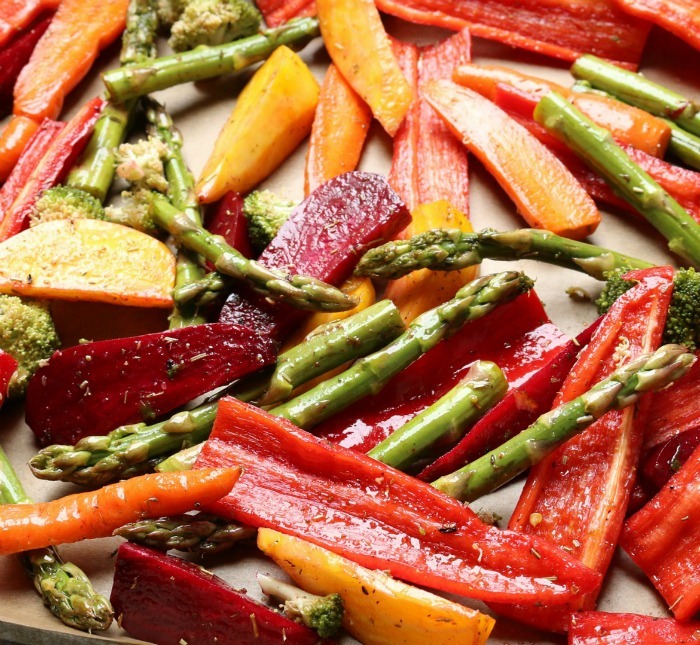 Everyone, even inexperienced cooks, can master the art of oven roasted vegetables. After all, there is not that much to master. It’s just chop, season, adding oil, turning and letting the oven do its thing. Would you like a reminder of this post for oven roasted vegetables? Just pin this image to one of your cooking boards on Pinterest so that you can easily find it later. 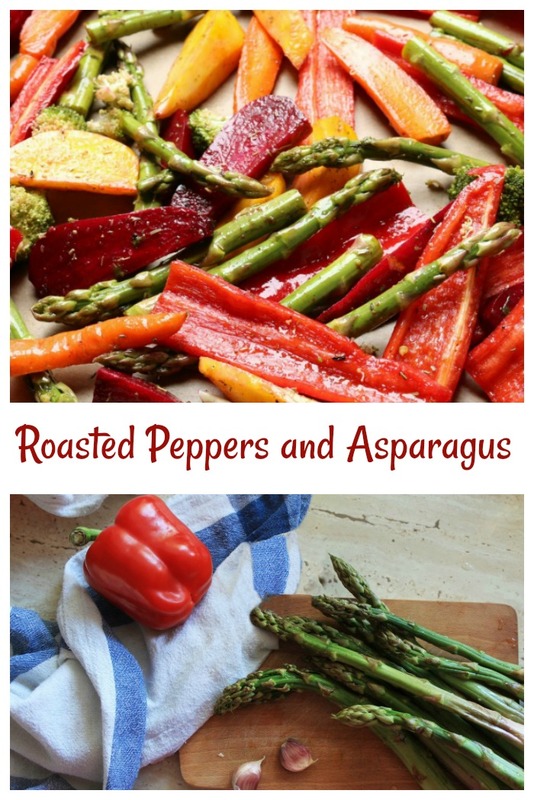 And for another tasty roasted vegetables recipe, try these Roasted peppers and asparagus. They are ready in less than 30 minutes! These roasted peppers and asparagus cuts are ready in less than 30 minutes and make the perfect side dish. Preheat oven to 425 º F (218 º C). Toss the asparagus, peppers, onion powder, garlic, salt, and pepper in the olive oil. Roast for 15 to 20 minutes, until veggies are tender and starting to brown slightly.